We have one criticism of the Daily News’ cover. We think it was too gentle on the NRA. It is time to recognize that the NRA is a powerful manipulative organization that has nothing to do with protecting the American spirit, preserving conservative values or defending America from a left wing overthrow, but rather it guards the interests of weapons manufacturers whose products are not targeted for sporting but rather for mass killings. The murder weapon, which is similar to the AR-15, is a semi-automatic rifle with the capability of carrying 30 rapid fire rounds. To defend it is the moral equivalent of endorsing unrestricted use of hand grenades. In its defense, the NRA presents a contemporary version of the old “if guns are outlawed only outlaws will have guns” argument. That is a twist of logic which tries to use irony to obscure the fact that no one is urging outlawing all guns, just those that are capable of causing mass destruction within seconds. It is not guns that are the problem, it is the terrorists, the NRA condescendingly explains to us. The terrorist’s acts would be less lethal, however, if their arsenal was more limited. We believe in the American two-party system and that Democrats and Republicans play an important role in keeping each other in check. They represent the dynamic between need and caution. Out country would be worse off if one party dominated for too long. 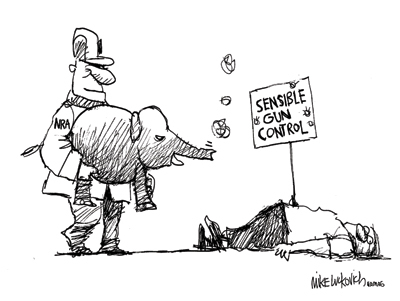 The Republican Party, however, is wrong in its entrenched support of the NRA and assault weapons. There are times when government does have to take a stand, when it does have to say, “you can’t do that” (just as it did with cigarettes), and among those times is when innocent people are being mowed down by machine guns. NRA defenders will say that opposition is just the moaning of the liberal media and, in the case of The New York Daily News, that could be true. But city magazines, such as this one, are traditionally more middle-of-the-road. The political spectrum can sense when there is too much blood.